Whenever a new semester begins after a long school vacation, campuses get crowded. The campus, a place for widening knowledge, building friendships, and designing the future, is another home for students. The Church of God holds the semester opening service every year to sow faith and courage in the hearts of students who strive to achieve their dreams, shuttling between libraries and lecture rooms every day. 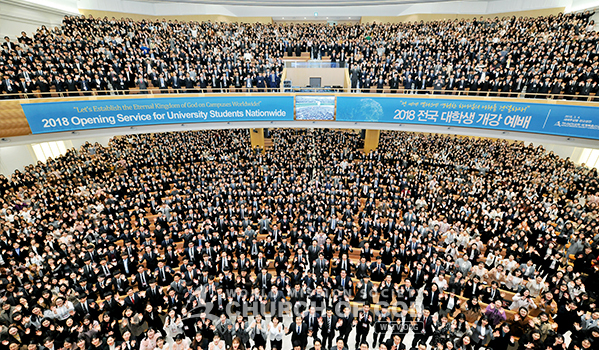 On March 4, the Semester Opening Service for University Students 2018 was held at the New Jerusalem Pangyo Temple in Korea. 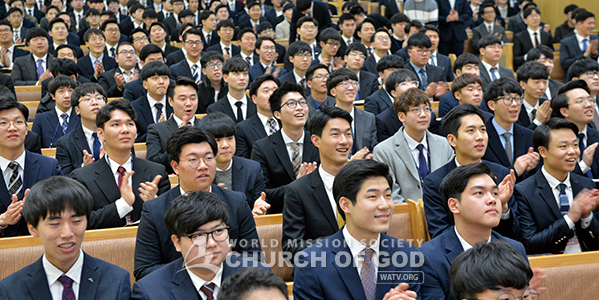 It was attended by 4,500 members such as university students including freshmen, teachers, and the pastoral staff in Korea and some from overseas churches who came to Korea to attend the General Assembly. Blessing their new start in spring, Mother prayed that great heavenly rewards and the grace of the Holy Spirit would come upon those who not only studied but also worked hard to preach God’s love and truth and to guide the world to the right way in the previous year. Mother complimented them, “The university students are playing an important role in saving mankind with faith and passion according to the prophecy that the youth like the dew of the dawn will dedicate themselves to the gospel work.” Mother also encouraged them to diligently preach the truth of the new covenant which has the promise of salvation and Zion the safe refuge to people who are anxious about all kinds of disasters and economic crises, and explained in detail about virtues such as greeting, humble words, and courtesy. Mother added, “Let us shine the light of Christ to our friends and neighbors who are tired with the dry and heartless reality by living godly lives as those who’ve been approved by God” (Jn 1:10–13; 1 Th 2:3–4; Jer 4:5–6; 1 Ti 4:6–8). 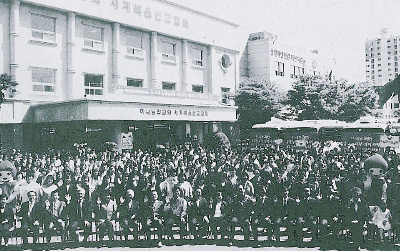 General Pastor Kim Joo-cheol mentioned a quote of Ahn Chang-ho, one of Korean independence activists, and asked the university students to have the sense of responsibility and the mind of a master as future leaders and Christians. “In obedience to Mother’s words, let’s keep manners towards teachers and make our campuses more meaningful places through exemplary conduct like studying hard and making efforts for the life of faith. The year 2018 will belong to you who diligently put God’s teachings in practice,” he said. Nach dem Gottesdienst posierten alle Studierenden mit einem hellen Lächeln auf den Gesichtern zu einem Souvenirfoto und zeigten ihre Freude über den Semesterbeginn. After the worship service, the awards ceremony was held for those who gained good results in IUBA [International University Student Bible Academy] grades and other areas. About 50 students were awarded for setting good examples for others. Then, the students and graduates made presentations on “College Life Guide” to settle the year 2017 and introduced college life and activities to freshmen. 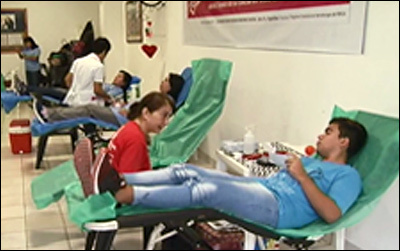 Voluntary services particularly attracted the freshmen’s attention. 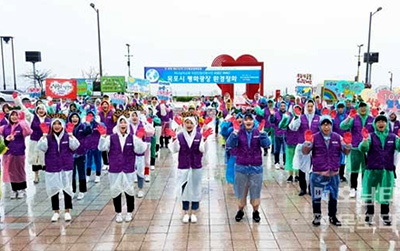 According to the results of settlement, the university student members of the Church of God around the world held the “Green Campus Cleanup” at 81 campuses in 25 countries over the past year, and carried out extensive projects such as Mother’s Street, environmental seminars, tree planting, and Korean language education in about 30 cities of 23 countries. Based on these activities, they have established campus clubs in academic, volunteer, or environmental fields in cooperation with local university students. It is to help talented students with different majors to exchange knowledge and opinions, so that they can work in various ways such as taking care of the underprivileged in communities and enlightening citizens. In one university in Brazil, the students created a club for the first time in 110 years since the university’s foundation, receiving positive responses from the other students and the school authority. Presentations and videos about the students’ challenge and accomplishments followed: ASEZ Global Forum which started in Korea and was held in the U.S., Philippines, Malaysia, Mexico, Argentina, India, etc., and MOUs [Memorandum of Understanding] with local governments, public institutions, and universities for constant and wider range of services. The participants looked excited on their way to their campuses. “The semester opening service and IUBA education which Mother allows every year are nutrients for me to grow. Thanks to them, I was able to overcome obstacles, depending on the words of the Bible. I will continue to use my time meaningfully so that I can fill the rest of my campus life with valuable learning and practice in God,” said Sister Choi Hui-won, a senior at Kyung Hee University. “When the Korean students came to Colombia as an overseas cultural experience team, they grew more mature and gained a bigger viewpoint while carrying out voluntary services and communicating with local students. They also demonstrated to local residents as well as college students the good culture of Zion such as humility, sacrifice, and love,” said Elder Yu Jae-seok from Medellin Church in Colombia, expressing high hopes for their future activities.